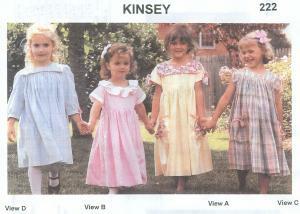 Kinsey is a square neckline dress with four variations. There is a high yoke and an above the waist yoke. A ruffle collar, a square collar and pockets are included. Patterns for short cuffed sleeves, short sleeves with ties. small cap sleeves, and three-quarter sleeves are in the package.